I’ve been away for a week. I had a fabulous time at the beach and at home with my friends and family. I hadn’t been working out regularly during the week and, as you may expect, I haven’t been feeling awesome. Don’t get me wrong, I had a blast, but there was something missing. I told myself that for the week I would do what I wanted. If I felt like working out I would and if I didn’t I wouldn’t. Perhaps most importantly, I promised myself not to feel guilty about whatever choices I made. Between traveling, spending time with friends and family and taking “ME” time, I didn’t work out. This past Saturday I taught my first class in a week…I thought I would DIE! No joke, my lungs were on fire, my heart was racing, my legs were wabbly…it was AWFUL. I mean I think class was great, but my bod felt a wreck. I know it takes 2 weeks to become fully deconditioned…and I didn’t need anyone to tell me, I felt it…even more than 1/2 way there. Just as much as the physical challenge I felt mentally BLAH. I knew that working out would lift the blase away and it totally did. Now here’s some proof as to why. I just read an article that was published on ABC News entitled, Exercise and Music Clear the Brain. Well, DUH…I know that! But you know how those scientists are…they don’t just rely on feelings…they need proof. Well, they got it. 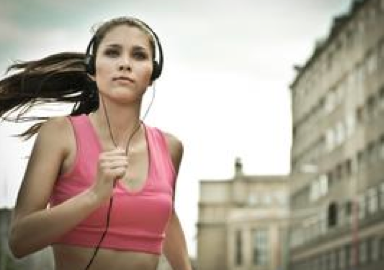 The study that was run by scientists showed that on average, participants performed more than twice as well on a verbal fluency test after listening to music while exercising than they did after exercising without the music. You know I’m totally here for all of you. I share my experiences, so they can be learned from. In this case I think the take away is, listen to your body, move your body and move it to music. Don’t wait. If you feel like it’s been too long to get back in the game tell that voice to SHUSH, tomorrow it will only be longer! Get up today and shake it, Sister! It will not only make you feel better, but it will make you twice as verbally fluent! This entry was posted in FIERCE FUN, FIERCE HEALTH, FIERCE SOUL, FIERCE WORKOUTS, FIERCE- ISH and tagged dancing, health, mind, music, peace, proof positive, science by GETFIERCE TRAINING. Bookmark the permalink.